The very best minds in the anti-narcotics business are holding a major conference in Moscow. The primary concern is the flow of drugs from Afghanistan, something that is far more destructive than terrorism. Heads from around 40 countries gathered in Moscow to figure out how to win the battle against drugs, a problem daunting in scope. Of course it is not only the problem of dealing with drug addicts but also first and foremost the issue of tackling drug trafficking and drug production, which Afghanistan is notorious for. Local peasants there head the production line. Heroin is a huge problem for the world at large, but as for Russia specifically this problem is monstrous. Around 80 tons of heroin, mostly produced in Afghanistan, are consumed in Russia annually. During his opening address to the summit, Russian President Dmitry Medvedev said that the drug problem should not be politicized. “We shouldn't distinguish between countries where drugs are a threat to all mankind, and countries which say – let things be as they are, we will see what the future holds. Any political games around this huge problem are unacceptable; they weaken our common anti-drugs coalition,” Medvedev warned. “Afghanistan today is the world's main drugs supplier. But the problem has spread over regional borders. That's why our common goal is to prevent the globalization of the criminal world,” he concluded. Russia is thought the main victim of the Afghan drugs trade. Still, the use of drugs is consistent globally and many countries suffer from it. Globally, hundreds of thousands drug addicts die every year of heroin, the majority of them young people in their early twenties. The necessity of an international effort to fight drug production and trafficking was one of the main ideas expressed at the conference. Heroin production and trafficking in Afghanistan is a huge business worth $60 billion a year and its participants have no intention of giving it up voluntarily. It is a large source of income for poor Afghan farmers and putting it to an end means finding new ways to earn for living for all those who currently cultivate opium poppy. This would mean re-building the whole economic situation in Afghanistan altogether, which is what the anti-drug conference is aiming to discuss. Some ideas have already been suggested, like various ways of re-establishing the Afghan economy. They mainly revolve around the idea of suggesting to Afghan farmers alternative ways of making a living instead of cultivating opium poppy. Meanwhile, the battle against drugs is not getting any easier according to Russian Prime Minister Vladimir Putin. “International terror organizations have settled down comfortably at the Afghan-Pakistan border, receiving massive financial support, which comes via drug dollars,” he maintained. “I would like to stress that the issue of Afghan drugs production and smuggling has exceeded the regional scale and is now a global threat. According to the UN study, Afghan opium and heroin have taken the lives of about one million people around the world. Isolated countermeasures can hardly bring tangible results. I believe that the problem is serious enough to be specially considered by the UN Security Council,” he concluded. Program Director of the German Council on Foreign Relations Alexander Rahr is sure that the drug problem is more a political one than a social or an economic one, because NATO, which is the force that is stabilizing Afghanistan, does not have a mandate to fight drug trafficking and the local government is reluctant to do radical steps like destroying crops of opium poppy. “One of the practical solutions is maybe to involve the [Shanghai Cooperation Organization], a partner of NATO in dealing with this issue,” he proposed. It is obvious that there would be no drug problem if other people were not creating the demand for drugs in Europe, the US and Russia. That is why Afghanistan’s heroin problem needs a “world solution”, insists Curtis Weldon, US government security consultant. Russia and NATO view the involvement of Asian partners, including Afghanistan, in fighting the drug trade as a priority. At the end of 2010, Russia and NATO are going to invite Pakistan to join in the anti-drug project. “Our project works and it is certainly useful,” said NATO official Maurits Jochems. “We have already trained more than 1,000 officers for law-enforcement bodies who are working in Middle Asia and Afghanistan,” said Jochems. Human rights advocates stress that whatever approach is chosen, it should be within the framework of international law. According to Russian officials, it is the coalition forces headed by the US, currently conducting the War on Terror in Afghanistan since 2001, which has not been doing enough to battle drug production and trafficking in the country. As a result, the quantity of Afghan heroin is being pushed through Central Asian countries and the Caucasus to Russia, and then on to Europe. Russia believes the coalition contingent could be doing a lot more to prevent heroin trafficking. Instead, the War on Terror could be renamed the War on Drugs so that the coalition forces have a reason to remain in Afghanistan in the future. Russian Foreign Minister Sergey Lavrov called for the UN Security Council to actively participate in preventing drug trafficking and drug production. Russia’s envoy to NATO Dmitry Rogozin exposed that the coalition forces fighting Taliban insurgents in Afghanistan do not do enough to prevent drug cultivation and trafficking in the country. “The USA is not going to launch a large-scale operation aimed at the destruction of opium poppies in Afghanistan,” the U.S. ambassador to Russia, John Beyrle, told the Ria Novosti news agency. Beyrle said that the experience the U.S. has in this field shows that such operations can have the opposite effect. 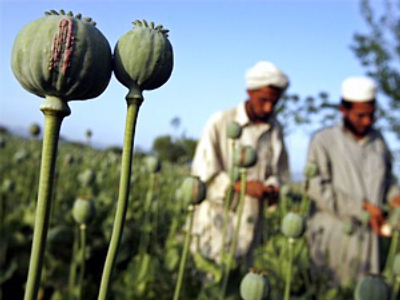 If poppy fields are destroyed, Afghani farmers lose their main source of income and join the Taliban. “Neither the USA, nor Russia, nor NATO is interested in this,” said Beyrle. However, he mentioned that the U.S. is closely cooperating with local authorities so that the latter can put pressure on the farmers and force them give up cultivation of poppies. UN Deputy Secretary General Antonio Costa also said that foreign troops in Afghanistan do not destroy poppy fields as that would be “logically ill-founded” to take the main source of income away from Afghani farmers. Some analysts, however, do doubt that it is the Taliban who control the drugs trade in Afghanistan. “I think it’s very important to understand that a great deal of drugs trade is organized and controlled by members of the Karzai government. These are the people whom British and NATO troops are keeping in power,” Craig Murray, former UK Ambassador to Uzbekistan, told RT. Mr. Murray points out that opiates can be used to the benefit of people in such areas as pharmaceuticals, but a major international effort is needed. NATO’s policy has come in for heavy criticism. Weiner said it is the world’s responsibility to come together in fighting drugs. “If we do not stop the opportunity of the terrorists of making money through drugs they will continue to harass, haunt and kill all over the world,” he added. 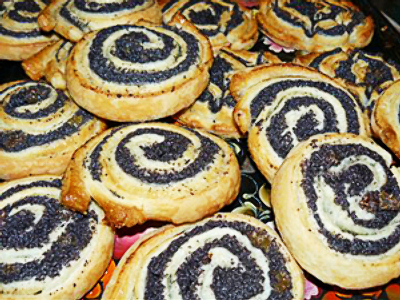 Poppy seeds: food or drug?